A Scentsy Bar FAQ for our new Scentsy customers to get the most from your Scentsy scent bar wax. It’s very simple: plug in your Scentsy Warmer, add your wickless candle wax, or Scentsy tarts as some customers call them, then turn on your Scentsy Warmer. Simple, right! Buy Scentsy wickless candle refills and enjoy a safe candle alternative to traditional candles. Our wax is made of the highest standards and quality on the market, and is formulated to melt at a very low temperature. Our low-heat Scentsy Warmers and Scentsy Wax Bars are a unique system, and meant to be used together for optimal scent throw and lasting fragrance. How much Scentsy wax do I use? Our Scentsy tarts come in a clamshell and can easily break apart with eight scored cubes. Choose your favorite Scentsy fragrance, break off 3 or 4 cubes of Scentsy wax, and place in your Scentsy Wickless Candle warmer. For Scentsy Nightlights, I use 1 cube of a Scentsy refill bar. Next turn on your Scentsy warmer…relax and enjoy your safe candle. When your scent is gone, dump out the melted wax, wipe out the top of the warmer with a paper towel, and then start fresh with more cubes. Old wax tends to hold the scent of the new wax, so always start with fresh cubes. 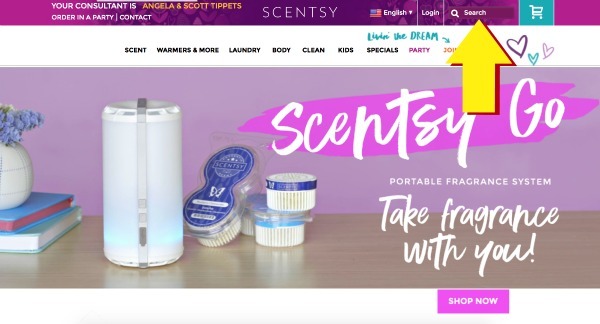 What kind of wax does Scentsy use? Scentsy uses a food-grade petroleum based wax. Scentsy chose this wax because of its superior scent loading ability, melting point, and firmness. Our scented candle wax tarts are made of specially blend wax that can hold 2-3 times the fragrance of votives and tarts in the market today (including those soy candles). Scentsy Warmers only warm the fragrance so the wax never dissipates. Because there is nothing “burning”, there is no danger of chemicals being released into the home. No wick, no match, no flame, no soot, no smoke, and no wax evaporation! Are you looking for one particular Scentsy scent (a single note of scent like cinnamon, or patchouli)? You can look up single note fragrances by doing a search on my e-commerce site. Simply type the fragrance note into the search box and all the current fragrances with that note will populate.